When the Power Glove was released in the early 1990s, the idea that you could control games with hand motions was incredible, but like the Virtual Boy that followed years later, the hardware of the day just couldn’t keep up. 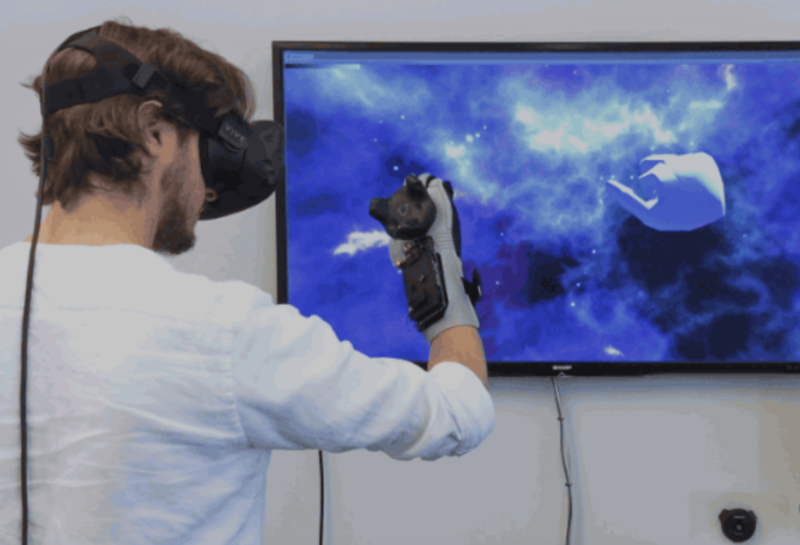 Today, hardware has finally gotten to the point where this type of interface could be very useful, so Teague Labs decided to integrate a Power Glove with an HTC Vive VR headset. 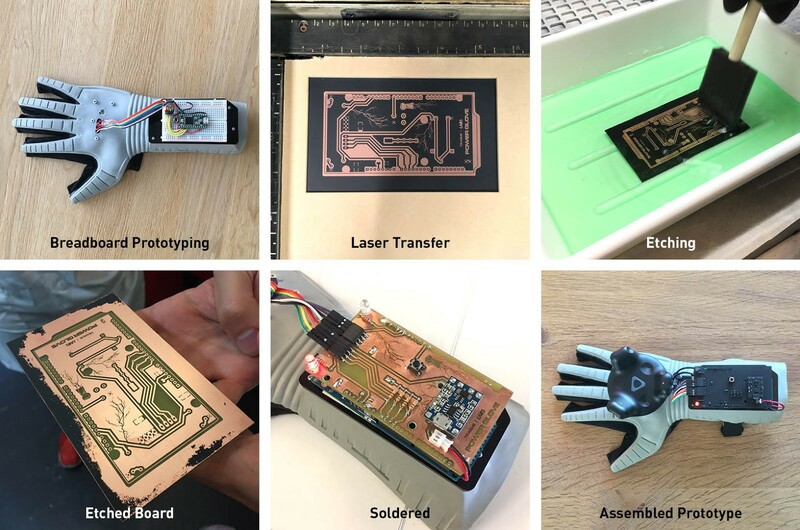 While still under development, the glove’s finger sensors have shown great promise for interactions with virtual touchscreen devices, and they’ve even come up with a game where you have to counter rocks, paper, and scissors with the correct gesture. Making this all possible is the Arduino Due, which supports the library for communicating with the Vive tracker. We took a Power Glove apart, 3D scanned the interfacing plastic parts and built modified parts that hold the Vive Tracker and an Arduino Due on the glove. After some prototyping on a breadboard, we designed a shield for the Due and etched it using the laser-cutter transfer technique. We then soldered all components and spray-painted the whole shield to protect the bare copper. After mounting the tracker and tweaking the code by matzmann666, we had the glove work. If you’d like to see the details of what has been accomplished so far, check out the Teague Labs team’s design files and code on GitHub. Redditor “xmajor9x” has spent several weeks building a three-legged machine to balance a metal ball on top of a plate. The device uses three servos attached to a rectangular surface with linkages that translate servo position into linear displacement of the table. This allows it to keep the ball centered, or rotate around the perimeter in a circle or square pattern. An Arduino Due controls the ball using a PID loop, and the ball’s position is sensed not by an external camera, but by the top “plate,” which is actually made out of a resistive touchscreen. Although this adds a very unique element, it means that the ball on top must be quite heavy to be reliably tracked, and its creator is considering switching to a computer vision system in the future. If you’ve seen color sensors such as the TCS34725, you may have considered them for projects that can pick out one colored object over another. On the other hand, if you were to take one of these sensors, mount them to an Arduino-driven plotter, and then take readings in an X/Y plane, you’d have all the elements needed for a simple single-pixel scanner. 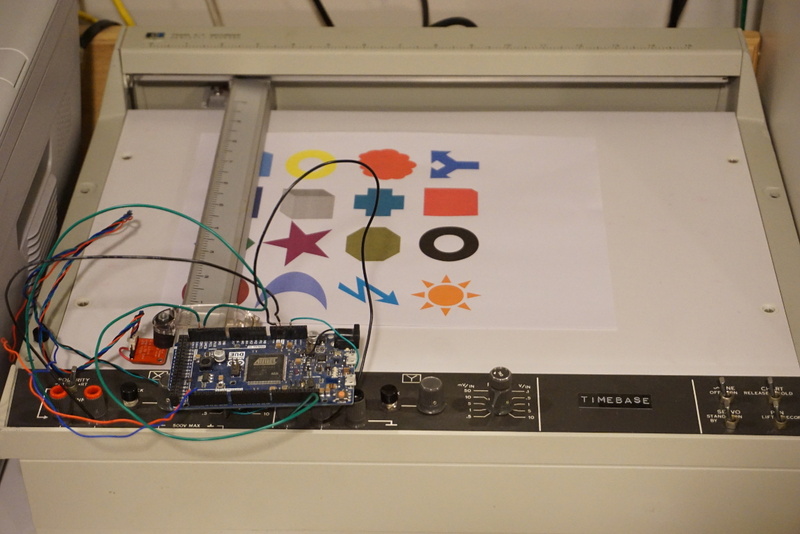 In the video seen below, Kerry D. Wong does just this using his hacked HP 7044A plotter to scan a picture, recording RGB color values in a 128 x 128 grid. 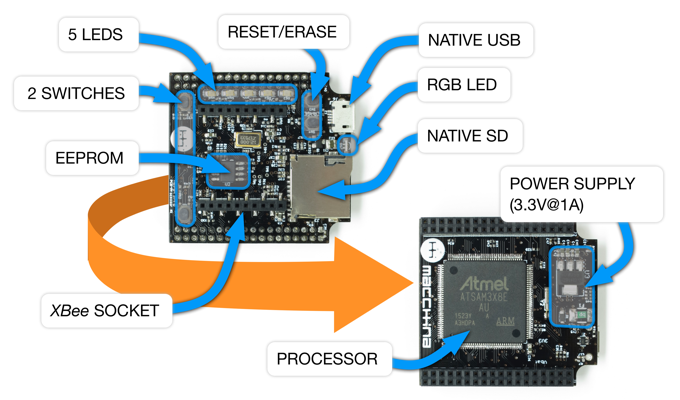 As the device scans, the Arduino Due used for control passes these values to a computer, which assembles them together into a low-resolution image. You can find more details on the project, including its code, in Wong’s blog post here. 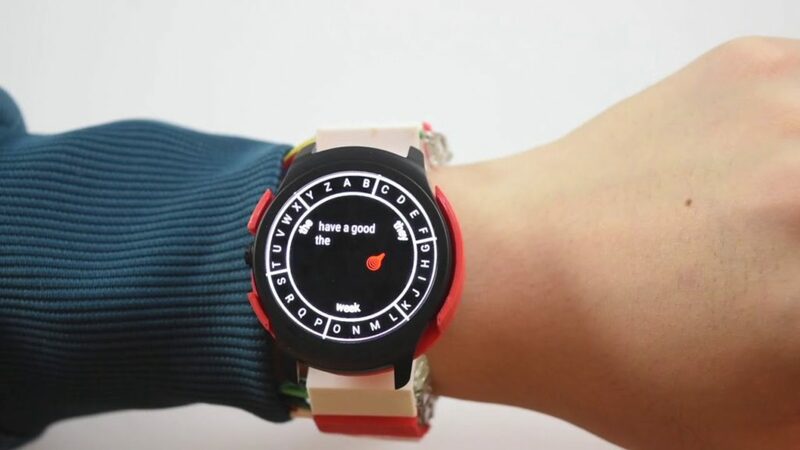 To address the limitations of today’s fixed-face watches, researchers have come up with an actuated smartphone concept that physically moves itself using an Arduino Due, Bluetooth and several motors. Receiving Internet notifications has gone from using a computer, to checking them on your smartphone, to now simply seeing them come in on your wearable device. On the other hand, you still have to rotate your wrist into the right position to see the screen. Worse yet, if you want to show others what is on your wrist, you may even have to twist your arm awkwardly. Fortunately, there is a possible solution to this scourge in the form of Cito, which bills itself as “An Actuated Smartwatch for Extended Interactions.” This design can move in five different directions–rotates, hinges, translates, orbits and rises–potentially making viewing more convenient, or even providing haptic feedback. Prototype electronics are housed inside a control box on the upper arm, but presumably would become much smaller in a production version. You can see the team’s entire paper here, or read this write-up for a more involved summary. Browse around eBay for an original Altair 8800 and you quickly find that the price range is in the thousands of dollars. If you are a collector and have some money in your pocket maybe that’s okay. But if you want the Altair 8800 experience on a budget, you can build yourself a clone with an Arduino. [David] kindly shared the build details on his Arduino Project Hub post. Using an Arduino Due (or a Mega for 25% of original speed), the clone can accurately reproduce the behavior of the Altair’s front panel elements. We covered a similar project in the past, using the Arduino Uno. While not overly complicated to build one, you will need a fair amount of patience so you can solder all the 36 LEDs, switches, transistors, and resistors but in the end, you’ll end up with a brand new computer to play with. In 1975, an assembled Altair 8800 Computer was selling for $621 and $439 for an unassembled version. Sourced right, your clone would be under 50 bucks. Not bad. The simulator comes with a bunch of software for you to try out and even games like Kill-the-Bit and Pong. BASIC and Assembler example programs are included in the emulator software and can easily be loaded. In addition, the simulator includes some extra functions and built-in software for the Altair which are accessible via the AUX1/AUX2 switches on the front panel (those were included but not used on the original Altair). From starting different games to mount disks in an emulated disk drive, there are just too many functions to describe here. You can take a look at the simulator documentation for more information. After winning the South African National Barista Championship in 2009, Neil Maree decided to actually start a company to make coffee roasting equipment. 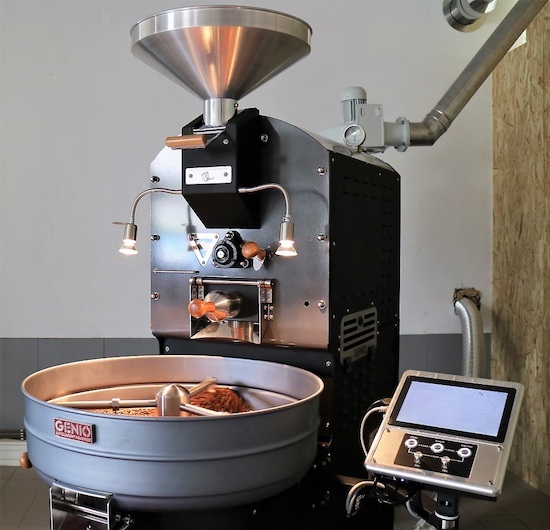 Genio was the result, and after some work, his machines can now roast coffee to perfection using recipe input via an Android app. Once instructions are transferred, a heavily modified Arduino Due controls the roaster depending on user preferences. Maree first tried an analog solution, then used a PLC before deciding that the Arduino was what he needed. 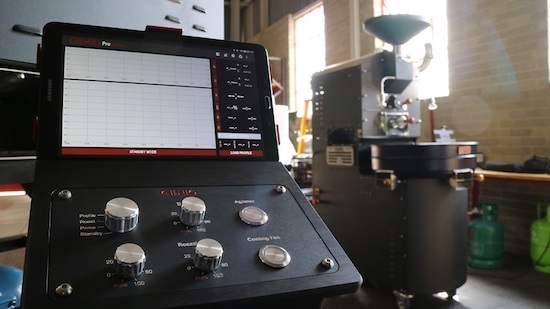 All of Genio’s roasters have a control panel with a variety of traditional switches and knobs, and then a not-so-traditional tablet mount. The app sends a “roast profile” to the roaster over a Bluetooth connection. Perk your interest? You can take an inside look at the roasting machine factory on htxt.africa here. Although smartwatches were designed to be an easy-to-use alternative for your smartphone, interacting with their touchscreens still requires your opposite hand to be free. So what do you do when you’re carrying a bag of groceries or holding onto a bus handle? 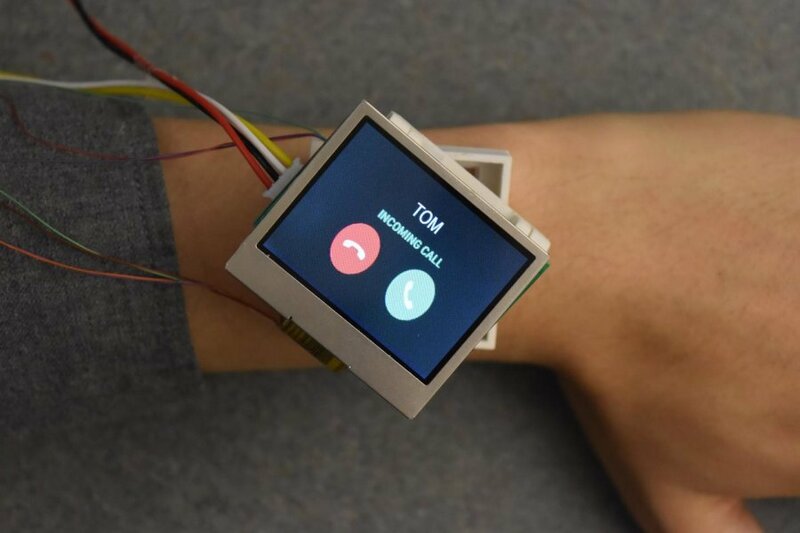 This is the problem a Dartmouth-led team set out to solve with WristWhirl, a smartwatch prototype that uses the wrist wearing the device as a joystick to perform common touchscreen gestures with one-handed continuous input, while freeing up the other hand for other tasks. 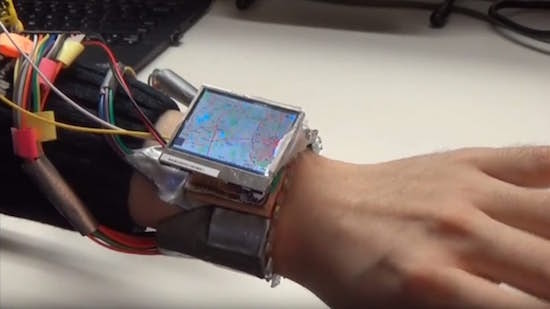 WristWhirl was built using a two-inch TFT display and a plastic watch strap equipped with a dozen infrared proximity sensors and a piezo vibration sensor, which is connected to an Arduino Due board. Commands are then made by moving the hand as if it were operating a joystick, while a finger pinch turns the sensors on/off to indicate the start or end of a gesture. For starters, the team implemented four sample applications with off-the-shelf games and Google Maps to illustrate potential use cases. Four usage scenarios for WristWhirl were tested: 1) a gesture shortcuts app was created, which allowed users to access shortcuts by drawing gestures; 2) a music player app was created, which allowed users to scroll through songs through wrist-swipes and play a selected song by double tapping the thumb and index fingers; 3) a map app was implemented for which 2D maps could be panned and zoomed depending on where the watch was held in relation to one’s body; and 4) game input, which often requires continuous input was tested, for which Tetris was played using a combination of wrist swipes, wrist extension and wrist flexion. You can read more about the project on its page here, as well as see a demonstration of it below! 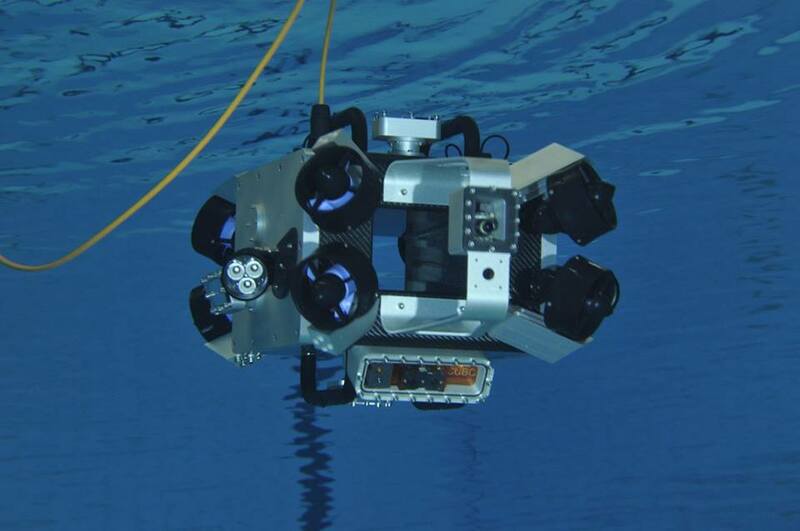 A team from ETH Zurich has created an incredible submersible robot called Scubo as a way to scan entire coral reefs. Equipped with six onboard webcams, the omnidirectional device is capable of exploring the deep sea from every angle. What’s more, users can take a virtual dive by throwing on a pair of VR glasses to make it feel as if they’re swimming with marine life. 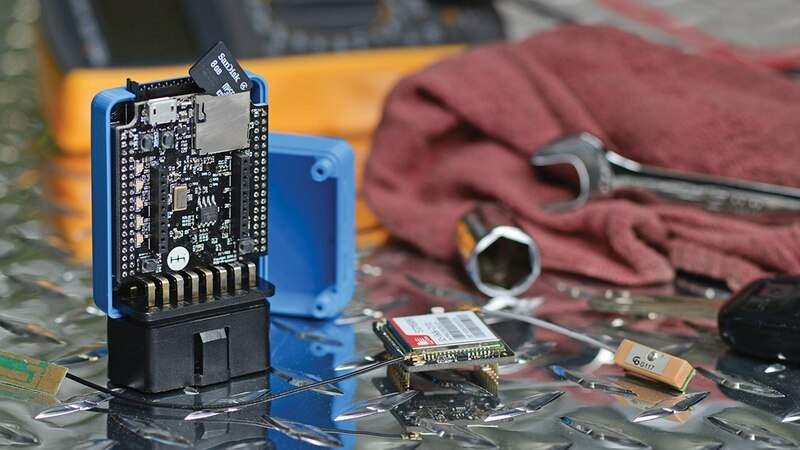 Scubo consists of an Arduino Due for hard real-time tasks, an Intel NUC for high-performance calculation, an IMU, and a pressure sensor — all housed inside a carbon cuboid. Eight thrusters are symmetrically mounted to the outside, one at each corner, while a tube goes through the box to ensure proper water flow and to keep the electronics cool. The system is neutrally buoyed and weight in the form of screws can be added to the thruster arms to adjust buoyancy and the center of gravity. A tether connects Scubo to a computer outside the water and the power source, which allows the camera pictures to be viewed live and the batteries to be recharged with a steady current. According to the team, this highly extends the operation time, though the batteries would last approximately 120 minutes under standard conditions without recharging. Scubo is based on ROS, and with the rosserial_arduino package, they are able to send or receive commands on a laptop from the Arduino. This enables them to steer the bot with a SpaceMouse joystick while monitoring all the sensor messages (pressure, leakage, temperature, voltage, etc.) at the same time. It should be noted that Scubo isn’t only restricted to coral research either. In fact, the underwater machine was built with modularity and entertainment in mind as well. Users can easily attach their own sensors, lights and HD cameras via one of five universal ports. We are confident that Scubo has great potential for the future. Since every necessary sensor is already implemented, Scubo can be programmed to scan a coral reef or any other place fully autonomous. Telepresence could be used in many aquariums or in the sea for entertainment. Because of the module ports different kinds of sensors and devices can be connected and used, for example to generate a geographical map of the sea floor or to inspect boats. 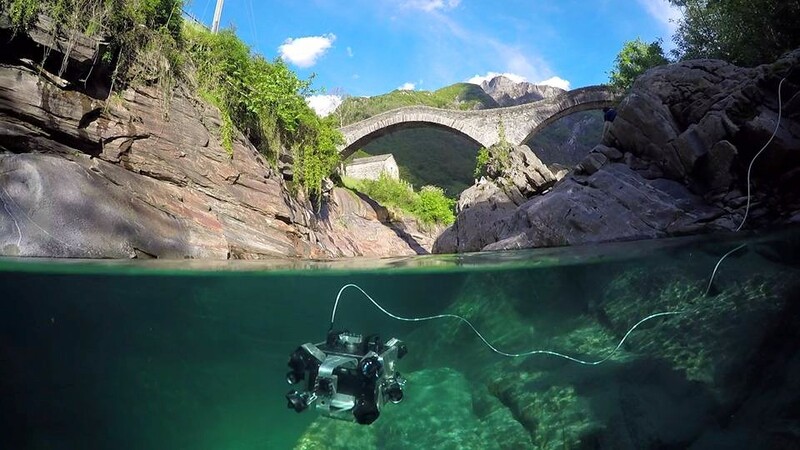 Whether corals in the Caribbean, the shore of Lake Zurich or even a virtual dive in an aquarium — Scubo not only convinces with its captivating technology but also with its modern design. Innovation starts when science meets entertainment. Intrigued? You can read more about the project on its website, and check out its trailer video below.